I've got some great books and dvd's in my studio and I'll try to get around to reviewing them for you. I've seen Jane Lafazio's dvd here and about, but just got around to watching it. Jane has a really fun approach to teaching which made me feel immediately comfortable. The concept of a small art quilt is so simple, yet many of us are intimidated by the process. I felt incredibly confident after watching the Small Art Quilt because there were so many neat ideas presented. I don't recommend watching too late in the evening because your head will be bursting with ideas! I chose to try the wool felt quilt because it looked so easy. I love the idea of working with small size because as Jane shows, you can finish a small quilt in a day or so (depending on how much handwork you want to do on it). This quilt is about 8.5" x 11". I gathered up a bunch of felt and sketched out at basic plan---window in the background and a bunch of tulips in the foreground. From there it was just a matter of cutting out some simple tulips and playing with them, adding layers and stitching. I used her pillowcase technique for the backing and then finished the quilt with a blanket stitch. I kind of got addicted to the stitching and kept going even after I thought it was done. I look forward to trying some of Jane's other ideas, like a watercolor quilt and ripped fabric quilt. I came away feeling that I want to make more time for these small jewels. Thanks Jane for making it so easy! 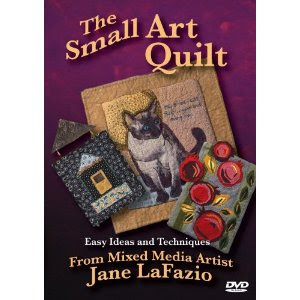 This is an excellent dvd workshop for anyone wondering how to get started or looking for some fresh ideas for mini art quilts. BTW--I didn't thread a single needle in this whole process. I'm hooked on the spiral eye needle...see my earlier post. I received Jane's DVD for Christmas and it really does need a warning label. I made the mistake of watching it about 11pm and thankfully didn't have to get up early the next day. Dreams of silk, felt, stitches. I love your tulip quilt. Once cannot help but be happy when looking at tulips. Have a great week. Love the colors you chose for your small art quilt! WOW!! this is beautiful!! i was debating ordering this DVD but after seeing this little treasure i will order it today! hey thanks Kelli and your quilt is wonderful!! I LOVE how you went off the edge! great colors and design, and yup, I see some obsessive stitching in the background that I personally know so well. Welcome to the club!!! and thanks again for the review. Love the tulips - was not really interested in the whole quilt thing until I see these pieces of art. Gonna have to have the DVD! Thanks Kelli for sharing. This is so beautiful! You have convinced me! I am getting that DVD! Wow! Beautiful work inspired by a great person and artist. Nice Job, Kelli! I am about drooling over those colors. I love the small art quilts, too! Just found you and I'm a happy gal. Just starting myself down this road. I also love your choice of color and I love the building of textures.